Suppressor of cytokine signaling 1 (SOCS1) is rapidly induced following stimulation by several cytokines. SOCS1 negatively regulates cytokine receptor signal transduction by inhibiting Janus family tyrosine kinases. Lack of such feedback regulation underlies the premature death of SOCS1−/− mice due to unbridled IFN-γ signaling. We used mouse embryo fibroblasts derived from SOCS1−/− mice to investigate the role of SOCS1 in IFN-γ signaling pathways. SOCS1−/− fibroblasts were exquisitely sensitive to the IFN-γ-mediated growth arrest and showed sustained STAT1 phosphorylation. However, SOCS1−/− fibroblasts were inefficient in MHC class II surface expression following IFN-γ stimulation, despite a marked induction of the MHC class II transactivator and MHC class II gene expression. 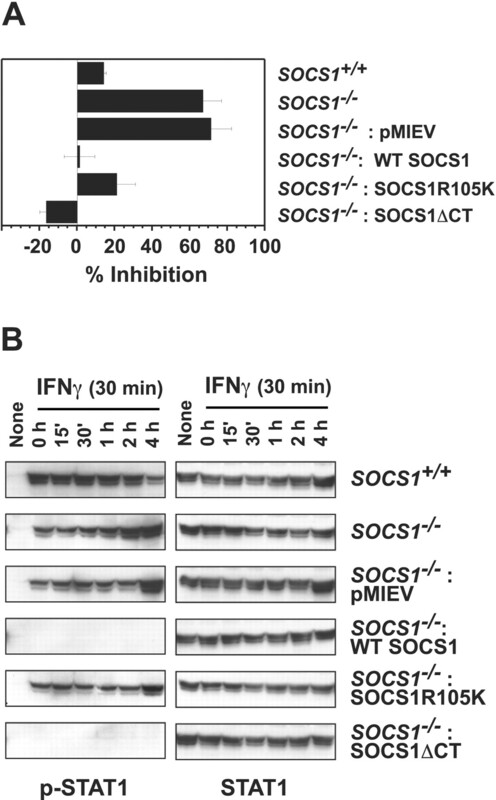 Retroviral transduction of wild-type SOCS1 relieved the growth-inhibitory effects of IFN-γ in SOCS1−/− fibroblasts by inhibiting STAT1 activation. SOCS1R105K, carrying a mutation within the phosphotyrosine-binding pocket of the Src homology 2 domain, did not inhibit STAT1 phosphorylation, yet considerably inhibited IFN-γ-mediated growth arrest. Strikingly, expression of SOCS1R105K restored the IFN-γ-induced MHC class II expression in SOCS1−/− cells, indicating that expression of SOCS1 facilitates MHC class II expression in fibroblasts. Our results show that SOCS1, in addition to its negative regulatory role of inhibiting Janus kinases, has an unanticipated positive regulatory function in retarding the degradation of IFN-γ-induced MHC class II proteins in fibroblasts. The suppressor of cytokine signaling (SOCS)4 family of signal regulatory proteins has emerged in recent years as prominent modulator of cytokine signal transduction pathways. The SOCS family includes at least eight members (SOCS1–7 and CIS), of which SOCS1, SOCS2, SOCS3, and CIS are differentially induced by various cytokines in a tissue- and cytokine-specific manner. Forced expression of SOCS1, SOCS3, or CIS inhibits signaling by multiple cytokines, while SOCS2 inhibits growth hormone and IL-6 family of cytokine signaling (see Ref. 1 for a review). Analyses of mice deficient for SOCS1, SOCS2, or SOCS3 have clearly established a role for SOCS proteins in regulating cytokine signaling networks (2, 3, 4, 5). MHC class II molecules expressed on restricted cell types present peptide Ags to CD4+ Th cells. Professional APCs constitutively express MHC class II, while in other cell types its expression is induced by certain cytokines. IFN-γ not only elevates MHC class II expression in professional APCs, but also induces de novo expression in monocyte/macrophage lineage, fibroblasts, endothelial cells, epithelial cells, neuronal cells, and muscle cells (see Ref. 6 for a review). Induction of MHC class II expression by IFN-γ is regulated primarily at the transcriptional level and is dependent on STAT1 (7, 8). IFN-γ stimulates expression of the transcription factors MHC class II transactivator (CIITA) and IFN response factors, IRF1-IRF4 (9). CIITA is obligatory for MHC class II expression (10), and IRF-1 is required for MHC class I up-regulation (11). CIITA does not bind to DNA directly, but functions to orchestrate the assembly of multiple transcription factors such as the RFX complex, X2BP/CREB, and NF-Y to the S, X, X2, and Y boxes at the promoter region of MHC class II genes (7, 12). Additional promoter-binding factors such as Oct-2 modulate cell- and stage-specific expression of MHC class II (13). Binding of IFN-γ to IFN-γR1 and IFN-γR2 stimulates the receptor-associated Janus kinases 2 (JAK2) and 1 that phosphorylate STAT1. Binding of phospho-STAT1 homodimers to IFN-γ activation site elements in the promoter regions of IFN-γ-responsive genes induces their transcription and subsequent pleiotropic cellular responses, including growth arrest, antiviral activity, differentiation, and MHC class II and class I expression (see Ref. 14 for a review). IFN-γ strongly induces SOCS1 (15, 16), and SOCS1−/− mice die within 2–3 wk after birth from fatty degeneration of liver and monocytic infiltration of visceral organs (17). This phenotype is suppressed in the IFN-γ-deficient background, suggesting that SOCS1 is the major intracellular regulator of IFN-γ signaling (2, 18). All members of the SOCS family have a central Src homology 2 (SH2) domain, a conserved carboxyl-terminal motif called the SOCS box, and a variable amino-terminal segment. SOCS1 inhibits cytokine signaling primarily by inhibiting the catalytic activity of all four members of the JAK family tyrosine kinases JAK1–3 and Tyk-2, thereby blocking the critical JAK-STAT pathway in cytokine receptor signaling (19, 20, 21, 22, 23). Structure-function analyses of the SOCS1-JAK interaction have revealed that the SH2 domain is critical for JAK binding, as mutation of the Arg105 residue within the phosphotyrosine-binding pocket abrogates JAK binding (23, 24). Recent studies have suggested that the SOCS box could also participate in the suppression of cytokine signaling. Similar to the von Hippel-Lindau tumor suppressor protein, SOCS1, via the SOCS box, binds to ElonginBC within a multiprotein E3 ubiquitin ligase complex containing Cullin2, Roc1/Rbx, and an E2 ubiquitin-conjugating enzyme (25, 26, 27, 28). This interaction targets the SOCS1-interacting proteins such as Vav and Tel-JAK2 to ubiquitination and subsequent proteasomal degradation (29, 30, 31, 32). Overexpression of SOCS1 completely blocks IFN-γ-mediated growth arrest, antiviral activity, differentiation, and MHC class II expression through inhibition of JAK1 and JAK2 activation, and STAT1 phosphorylation (15, 17, 33, 34). However, endogenous SOCS1, expressed within 1 h after IFN-γ stimulation (15), does not seem to interfere with the multitude of IFN-γ-induced cellular responses that span several hours following IFN-γ treatment. This raises an interesting possibility that SOCS1 may actually be mediating some of the temporally distant cellular effects of IFN-γ, in addition to attenuating the early signaling event. To address this issue in a defined genetic background, we established fibroblast lines (mouse embryonic fibroblasts; MEFs) from SOCS1−/− embryos, reconstituted them with SOCS1 expression constructs, and evaluated the effects of IFN-γ in terms of growth arrest and MHC class II expression. Our results show that SOCS1 plays an agonistic function in IFN-γ-induced MHC class II expression in fibroblasts. Breeding stocks of SOCS1+/− and SOCS1+/− IFN-γ−/− mice were kind gifts from J. Ihle (St. Jude’s Children’s Research Hospital), and the SOCS1−/− mice were bred in our animal facility. Murine rIFN-γ was a gift from E. Fish (University of Toronto, Toronto, Canada) and was also purchased from R&D Systems (Minneapolis, MN). NIH3T3 cell line expressing murine CSF-1 was a gift from P. Greer (Queen’s University). pBMN- internal ribosomal entry site (IRES)-Lyt-2 originated in G. Nolan’s laboratory (Stanford University, Stanford, CA). pBMN-green fluorescent protein (GFP) retroviral vector expressing human c-Myc was a gift from L. Penn (University of Toronto). PE-conjugated M5/114.15.2 (M5) mAb that recognizes the murine MHC class II molecules I-A and I-E of H-2b and H-2d haplotypes, biotinylated anti-MHC class I (H-2Db), and APC-conjugated Mac1 were purchased from BD PharMingen (San Diego, CA). Phosphoantibodies to STAT1, p38, extracellular signal-regulated kinase, and c-Jun N-terminal kinase were from New England Biolabs (Beverly, MA). Anti-upstream stimulatory factor-1 (USF-1) was from Santa Cruz Biotechnology (Santa Cruz, CA). Streptavidin-spectral red was from Southern Biotechnology Associates (Birmingham, AL). Mouse embryos at 14–15 days of gestation were obtained after euthanasia, eviscerated, minced, and digested with trypsin. Single cell suspensions were plated in DMEM containing 10% FBS and 50 μM 2-ME to culture fibroblasts. The monolayer cultures were continually passaged every 3–4 days, and the cells were used for experiments after 10 passages. Some of the SOCS1−/−, SOCS1+/−, and SOCS1+/+ fibroblast lines were immortalized by continuous passage. To culture macrophages, single cell suspensions prepared from the fetal liver were stimulated with CSF-1 (added as culture supernatant) every 3–4 days. The cultures were maintained in OPTI-MEM (Life Technologies, Burlington, Ontario, Canada) containing 10% FBS and 50 μM 2-ME. When the cultures became homogeneous and cleared of debris, the cells were infected with c-Myc-expressing retrovirus to establish permanent lines. The human c-Myc oncoprotein was expressed from a bicistronic vector with GFP expressed from an IRES. After 4 wk, the cultures contained mostly GFP+Mac1+ adherent macrophages. N-terminal hemagglutinin (HA)-tagged murine SOCS1 DNA fragment was amplified from pMT3-SOCS1 and subcloned in the XhoI and SalI sites of pMIEV retroviral vector expressing GFP as a selection marker from a bicistronic promoter (24) (see Fig. 4⇓A). SOCS1R105K carrying a point mutation (CGC changed to AAG) within the phosphotyrosine-binding pocket of the SH2 domain was generated by overlapping PCR (24) and subcloned into pMIEV. SOCS1ΔCT lacking the C-terminal SOCS box spanning the last 38 aa was generated by digesting pMIEV/SOCS1 with NotI and ligation. The retroviral SOCS1 constructs were stably transfected into GP + E retrovirus packaging line, and fresh culture supernatants from the virus-producing GP + E cells were used to infect embryonic fibroblasts in the presence of 2 μg/ml polybrene (Sigma-Aldrich, St. Louis, MO) for 2 h. After two to three consecutive infections, the cells were expanded and sorted for GFP-positive cells using FACStar (BD Biosciences, Mississauga, Ontario, Canada). Supernatants from the sorted GP + E cells were used subsequently to infect SOCS1−/− fibroblasts. cDNAs encoding α- and β-chains of I-Ab were cloned by RT-PCR from C57BL/6 splenocytes into pCDNA3.1 in frame with V5 and 6×His epitope tags. I-Abα was additionally tagged with HA epitope. Protein expression was confirmed in COS-7 cells by transient transfection and Western blot detection of HA and His tags. The constructs were subcloned into pBMN-IRES-Lyt2 retroviral vector (Fig. 8⇓C). Stable GP + E virus producer cell lines were established by sorting CD8+ cells. Culture supernatants from GP + E cells expressing I-Abα were used to infect fibroblast lines; cells expressing CD8 were sorted, expanded, and subsequently infected with I-Abβ-expressing retrovirus. Cells constitutively expressing the MHC class II molecule I-Abαβ on surface were sorted after staining with M5 Ab. Fibroblasts and macrophages at ∼80% confluency were stimulated with IFN-γ in the culture medium for indicated periods. For growth curve and MHC class II expression, 0.5–1.0 × 105 cells were plated in 24- or 12-well tissue culture plates in 2 or 3 ml vol and cultured for 48–96 h, in the presence or absence of IFN-γ. At the end of culture period, cells were trypsinized and counted by a Corixa (Seattle, WA) cell counter for growth analysis. Alternatively, cell growth was monitored by the Alamar Blue dye reduction assay (Biosource International, Camillo, CA). A total of 5 × 103 cells were plated per well in 96-well plates in the presence of various concentrations of IFN-γ. At the end of a 48-h incubation period, 20 μl of Alamar Blue was added to each well, and the plates were incubated further for 6–9 h. The plates were read in a microplate reader at 570 and 600 nm, and the amount of reduced dye (proportional to the number of cells and their metabolic activity) was calculated by following manufacturer’s instructions. To evaluate the surface density of MHC class II molecules following IFN-γ stimulation, ∼1–2 × 105 cells were stained with PE-conjugated M5 mAb that recognizes I-A and I-E of b and d haplotypes. MHC class I molecules were labeled with biotinylated anti-H-2Db, followed by streptavidin-spectral red. Stained cells were analyzed by FACScan (BD Biosciences). To stain intracellular MHC class II, surface molecules were blocked by 100 μg/ml of unlabeled M5/114.15.2 for 15 min on ice, followed by PE-labeled M5/114.15.2 in PBS/5% FBS containing 0.3% saponin. After 20-min incubation at room temperature, cells were washed in PBS/5% FBS containing 0.1% saponin and resuspended in PBS/5% FBS for FACS analysis. For biochemical analysis of signaling proteins, 5 × 105 cells were plated in 60-mm culture dishes and stimulated with IFN-γ at 80% confluent stage. At indicated time points, the cells were lysed in 100 μl of SDS lysis buffer (1% SDS, 50 mM Tris, pH 7.0, 1 mM EDTA, 1 mM DTT), scraped into Eppendorf tubes, and boiled. Lysates containing equivalent amounts of total proteins were electrophoresed in SDS-PAGE gels, transferred to polyvinylidene difluoride membranes, and probed with phospho-STAT1 Ab following the manufacturer’s instructions. The blots were developed by Renaissance ECL reagent from New England Nuclear (Boston, MA) life science products. The blots were stripped by incubating in stripping solution (2% SDS, 62.5 mM Tris, pH 6.8, 100 mM 2-ME) for 30 min at 55°C, blocked, and reprobed for STAT1. A similar protocol was followed for other phosphospecific Abs. For RT-PCR analysis of IFN-γ-induced gene expression, 5 × 105 cells were plated in 60-mm culture dishes and stimulated with IFN-γ at 80% confluent stage for 48 h. Total RNA was isolated using 1 ml of TRIzol (Life Technologies) following the manufacturer’s instructions. Equivalent amounts of RNA were primed with oligo(dT), and first strand cDNA was synthesized using Thermoscript reverse transcriptase (Life Technologies), according to the manufacturer’s protocol. PCR was performed on 10-fold serially diluted cDNA using Platinum Taq DNA polymerase (Life Technologies) in a GeneAmp PCR System 9700 thermocycler (PE Applied Biosystems, Foster City, CA). The PCR primers and product sizes are as follows: I-Aβb, 5′-GGCATTTCGTGTACCAGTTC-3′ (sense) and 5′-AGGTCCTTTCTGACTCCTGT-3′ (antisense), 664 bp; I-Eβb, 5′-GGAGAGTTGAGCCTACGGTGA-3′ (sense) and 5′-AGACTGTCCTTTCTGGTTCCT-3′ (antisense), 406 bp; I-Aα, 5′-TCCTGGAGACATTGGCCAGT-3′ (sense) and 5′-TCTCAGGTTCCCAGTGTTTC-3′ (antisense), 499 bp; mouse CIITA, 5′-GCAGCTACCTGGAACTCCTTA-3′ (sense) and 5′-CTCATTTACACGGGAGGTCAG-3′ (antisense), 685 bp; mouse invariant chain (Ii), 5′-GTGTCTGTTTCATCGTCCCAG-3′ (sense) and 5′-AAGGCAGCAAATGTGTCCAGC-3′ (antisense), 205 bp; mouse β-actin, 5′-GGCATTGTTACCAACTGGGAC-3′ (sense) and 5′-ACCAGAGGCATACAGGGACAG-3′ (antisense), 219 bp. For actin, CIITA, I-Aα, I-Aβb, and I-Eβb, the following PCR conditions were used: predenaturation at 94°C for 60 s, followed by 30 cycles of denaturation at 94°C for 30 s, annealing at 67°C for 30 s, and elongation at 72°C for 60 s. Ii fragment was amplified by predenaturation at 94°C for 60 s, followed by 30 cycles of denaturation at 94°C for 30 s, annealing at 65°C for 30 s, and elongation at 72°C for 30 s.
Subconfluent cultures of fibroblast lines grown in 60-mm dishes were stimulated with 1000 U/ml IFN-γ. After 36 h, cells were washed and incubated in Cys- and Met-free DMEM (ICN, Montreal, Quebec, Canada) for 30 min. The medium was replaced with Cys, Met-free DMEM containing 2.5% dialyzed calf serum and 200 μCi/ml Trans 35S-label (ICN; sp. act. 1175 Ci/mmol) to label newly synthesized proteins. After 60-min pulse, the cells were washed in PBS and lysed in buffer containing 50 mM Tris, pH 8, 150 mM NaCl, 1% Nonidet P-40, 6 mM 3-[(3-cholamidopropyl)dimethylammonio]-1-propanesulfonate, 50 μM PMSF, 50 μg/ml Nα-tosyl-lysine-chloromethylketone, and 10 μg/ml aprotinin (35). The lysates were precleared sequentially with rabbit Ig + pansorbin (Calbiochem, La Jolla, CA), pansorbin, and protein A-Sepharose (Amersham Biosciences, Uppsala, Sweden). Purified M5 mAb (10 μg/sample) was added to the precleared lysate, and MHC class II moecules were immunoprecipitated with protein-A Sepharose precoated with rabbit anti-rat Ig at 4°C overnight. Immunoprecipitated proteins were separated by SDS-PAGE and detected by autoradiography. Subconfluent cultures of fibroblast lines grown in 60-mm dishes were stimulated with 1000 U/ml IFN-γ or left untreated. After 36 h, the cells were treated with 10 μM cycloheximide (CHX; Calbiochem). At indicated time points, the cells were rinsed in PBS and lysed in SDS lysis buffer. Amounts of I-Abα and I-Abβ proteins were estimated by Western blot using anti-His Ab. The relative amounts of the MHC class II α- and β-chains remaining at different time points after blockade of protein synthesis were estimated using a laser-scanning densitometer (Molecular Dynamics, Sunnyvale, CA). The amount of proteins present in cells that did not receive CHX was used as reference to compare the decline after CHX treatment. IFN-γ induces cell growth arrest in a number of cell types, including macrophages, fibroblasts, and T cells (reviewed in Refs. 14 and 36). The growth-inhibitory property of IFN-γ is mediated through the induction of CDK inhibitors p27KIP1 and p21CIP1/WAF1 as well as by general inhibition of transcription and translation (36, 37, 38, 39). Because IFN-γ-induced growth arrest requires STAT1 activation by JAKs (37, 40), we investigated the effect of IFN-γ on cells lacking SOCS1, the negative regulator of JAK family kinases. MEFs established from SOCS1−/− embryos were highly susceptible to growth arrest by IFN-γ (Fig. 1⇓A). IFN-γ inhibited the growth of SOCS1−/− MEFs by >80% compared with 30% inhibition in wild-type cells after 96 h in culture. The SOCS1+/− MEFs showed an intermediate phenotype with 50% growth inhibition. To assess whether SOCS1 deficiency increases the sensitivity to IFN-γ, we used the Alamar Blue dye reduction assay that reflects both the number and metabolic activity of the cells. Increased susceptibility of SOCS1−/− fibroblasts to IFN-γ-mediated growth arrest was evident over a wide concentration range of IFN-γ after a 48-h culture period (Fig. 1⇓B). These results showed that SOCS1−/− fibroblasts are highly susceptible to IFN-γ-mediated growth arrest compared with wild-type cells. SOCS1−/− fibroblasts are highly susceptible to IFN-γ-mediated growth arrest. A, Fibroblast lines established from SOCS1+/+, SOCS1+/−, and SOCS1−/− embryos were incubated at 0.5 × 105 cells/well in 24-well plates with 1000 U/ml IFN-γ. After 96 h, the cells were trypsinized and counted. Results shown are mean ± SD for each group. The values within the bar denote the mean percent inhibition. B, IFN-γ dose kinetics was evaluated by Alamar Blue dye reduction assay following exposure to a wide concentration range of IFN-γ for 48 h. The results shown for each group are mean ± SD. Examination of the phosphorylated STAT1 levels as a measure of JAK kinase activation correlated directly with the susceptibility of fibroblasts to IFN-γ-mediated growth arrest (Fig. 2⇓A, top). Strikingly, phospho-STAT1 level decreased within 3 h following IFN-γ stimulation in wild-type fibroblasts, while it did not decrease in SOCS1−/− MEFs even at 24 h after stimulation. The STAT1 protein level increased 6–24 h after IFN-γ stimulation, as reported earlier (15). This increase in STAT1 protein levels was comparable between wild-type and SOCS1−/− fibroblasts. Densitometric quantitation of the phospho-STAT1 and STAT1 levels showed that the ratio of phospho-STAT1 to STAT1 decreased more slowly in SOCS1−/− fibroblasts compared with wild-type cells (Fig. 2⇓A, bottom). The elevated phospho-STAT1 level persisted longer in SOCS1−/− fibroblasts even after IFN-γ withdrawal, up to 4 h following 30 min of IFN-γ stimulation, while it was substantially decreased in wild-type cells (see Fig. 5⇓B). However, absence of SOCS1 did not lower the threshold level of IFN-γ required to stimulate STAT1phosphorylation, because both SOCS1−/− and wild-type fibroblasts showed identical IFN-γ dose kinetics (Fig. 2⇓B). 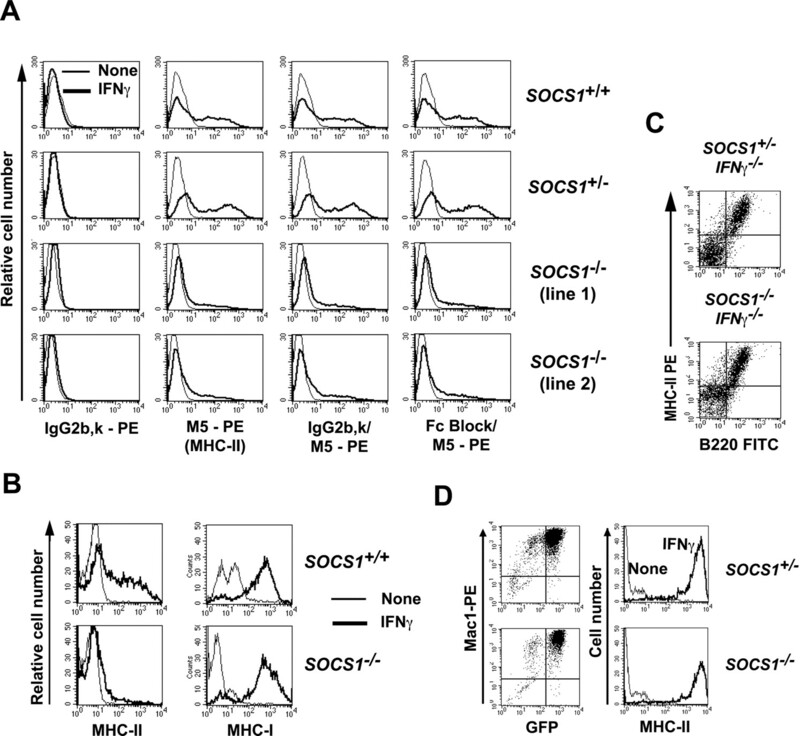 This sustained intracellular signaling in SOCS1−/− fibroblasts is specific to IFN-γ stimulation, as TNF-α-stimulated activation of mitogen-activated protein kinase family proteins was comparable between SOCS1−/− and SOCS1+/+ fibroblasts (Fig. 2⇓C). IFN-γ stimulates sustained STAT1 phosphorylation in SOCS1−/− fibroblasts. A, SOCS1+/+ and SOCS1−/− fibroblasts were exposed to 1000 U/ml IFN-γ. At the end of the indicated time points, cells were lysed in SDS sample buffer and probed for phospho-STAT1. The blots were stripped and reprobed for STAT1. The band intensities were quantitated by densitometry, and the ratio of phospho-STAT1 to STAT1 is represented in the bar graph. B, SOCS1+/+ and SOCS1−/− fibroblasts were exposed to the indicated concentration of IFN-γ. After 30 min, cells were lysed and probed for phospho-STAT1 and STAT1 sequentially. C, SOCS1+/+ and SOCS1−/− fibroblasts were exposed to 1000 U/ml TNF-α. At the end of the indicated time points, cells were lysed in SDS sample buffer and probed for phosphorylated p38, mitogen-activated protein kinase, or extracellular signal-regulated kinase. The blots were stripped and reprobed for corresponding protein levels. Because IFN-γ-induced MHC class II expression is dependent on STAT1 activation (8, 41), we investigated whether the sustained STAT1 phosphorylation in SOCS1−/− fibroblasts resulted in elevated MHC class II levels. Surprisingly, we observed that in SOCS1−/− fibroblasts, MHC class II induction by IFN-γ was substantially decreased compared with the SOCS1+/+ or SOCS1+/− cells (Fig. 3⇓A). Although 45% of the wild-type or SOCS1+/− cells expressed MHC class II molecules after 48–60 h of IFN-γ stimulation, only 14% of the cells were positive in two different SOCS1−/− fibroblast lines. The staining for MHC class II molecules is specific, and was not due to the binding of anti-MHC class II mAb (M5) to FcR because preincubation of cells with either a nonspecific mAb of the same isotype, or Abs blocking the FcR did not diminish the M5 mAb binding. The responsiveness of SOCS1−/− fibroblasts to IFN-γ was defective only in MHC class II expression, as the induction of MHC class I molecules was identical with that of wild-type cells (Fig. 3⇓B). The defective MHC class II expression in SOCS1−/− fibroblasts following IFN-γ stimulation was cell type specific because constitutive expression of MHC class II molecules in splenic B lymphocytes was comparable between SOCS1−/− and SOCS1+/− mice in IFN-γ−/− background (Fig. 3⇓C). Similarly, c-Myc-transformed Mac1+ macrophage lines established from SOCS1−/− mice responded equally well as the SOCS1+/− macrophages (Fig. 3⇓D). These results showed that SOCS1−/− fibroblasts have a cell type-specific defect in inducible MHC class II expression, despite a sustained and elevated STAT1 activation. MHC class II up-regulation following IFN-γ stimulation is inefficient in SOCS1−/− fibroblasts. A, A total of 1 × 105 cells of SOCS1+/−, SOCS1+/+, and SOCS1−/− fibroblast lines were stimulated with 500 U/ml of IFN-γ or left unstimulated in a 12-well culture dish. After 60 h, the cells were stained for MHC class II expression using PE-conjugated M5 mAb or isotype control and analyzed by flow cytometry. Specificity of M5 mAb binding was confirmed by preblocking with isotype control or anti-FcR (CD16/CD32) Abs. B, SOCS1+/+ and SOCS1−/− fibroblast lines were stimulated as in A and stained for MHC class II or MHC class I (H-2Db) expression. C, Macrophage lines established by infection with c-Myc-carrying retrovirus were stimulated with 500 U/ml IFN-γ for 48 h before analysis for MHC class II expression. The left panel shows GFP and Mac1 expression in the Myc-transformed macrophage lines. D, Splenocytes from SOCS1−/− and SOCS1+/− mice in IFN-γ−/− background were stained for B cells and MHC class II expression directly without exposure to IFN-γ. The requirement of SOCS1 for IFN-γ-induced MHC class II expression on fibroblasts suggested that SOCS1 might have an agonistic function in IFN-γ signaling independent of its role as a JAK inhibitor. To verify this notion, we generated stable cell lines expressing wild-type SOCS1, SOCS1 with R105K point mutation within the SH2 domain (SOCS1R105K), or SOCS1 lacking the C-terminal SOCS box (SOCS1ΔCT) by retroviral transduction and GFP selection (Fig. 4⇓, A and B). The steady state levels of the ectopically expressed SOCS1 proteins were not affected by IFN-γ (Fig. 4⇓C). However, SOCS1R105K was expressed at a much lower level compared with wild-type SOCS1 or SOCS1ΔCT. This decrease is unlikely due to reduced transcription or mRNA stability because GFP expressed from the same transcript is comparable between the SOCS1R105K and SOCS1ΔCT constructs (Fig. 4⇓B). Because SOCS1 protein is rapidly turned over (42), we tested whether the low steady state level of SOCS1R105K resulted from increased susceptibility to ubiquitin-mediated proteasomal degradation. Proteasomal protease inhibitors LLnL and MG-132 caused an accumulation of wild-type SOCS1, whereas SOCS1ΔCT was unaffected by either of the inhibitors (Fig. 4⇓D). LLnL had no effect on SOCS1R105K expression, whereas MG-132 caused a partial stabilization. These results suggest that: 1) the C-terminal SOCS box regulates the turnover of SOCS1, and 2) the decreased expression of the R105K mutant protein cannot be fully attributed to proteasomal degradation. Reconstitution of SOCS−/− fibroblasts with SOCS1 constructs. A, Schematic representation of the SOCS1 constructs in the retroviral vector pMIEV. B, A SOCS1−/− fibroblast line was infected with pMIEV retrovirus vector or pMIEV carrying wild-type (WT) SOCS1, SOCS1R105K, or SOCS1ΔCT, and stable lines were established by sorting GFP-positive cells. 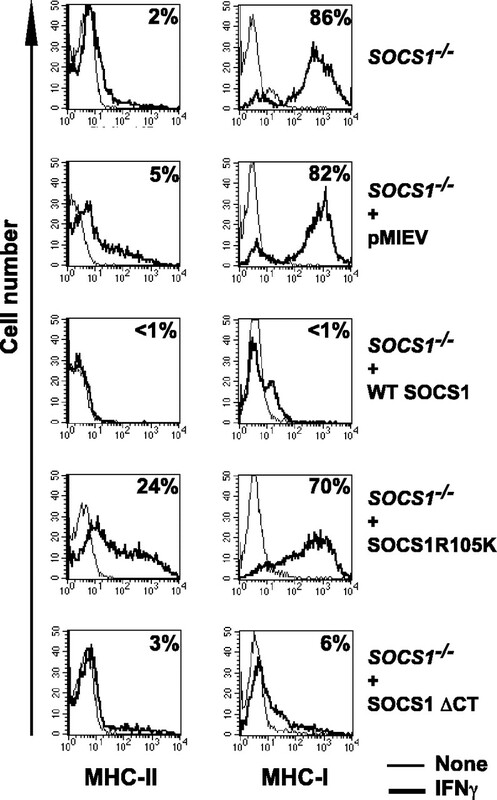 C, Total cell lysates from unstimulated or IFN-γ-stimulated SOCS1−/− cells carrying pMIEV vector, WT SOCS1, SOCS1R105K, or SOCS1ΔCT expression constructs were probed for the expression of reconstituted SOCS1 proteins. D, SOCS1−/− fibroblasts carrying pMIEV vector, WT SOCS1, SOCS1R105K, or SOCS1ΔCT expression constructs were incubated with proteasome inhibitors LLnL (50 μM) or MG-132 (20 μM) for 16 h and analyzed for the expression of SOCS1 proteins and actin. The bands were quantitated by densitometry, and the SOCS proteins were normalized for actin levels. The increase in the normalized values of SOCS protein expression in LLnL- or MG-132-treated cells is expressed as fold increase compared with the untreated controls. Analysis of the IFN-γ responses of SOCS1−/− MEFs reconstituted with the SOCS1 constructs showed that constitutive expression of the wild-type SOCS1 completely blocked IFN-γ-mediated growth arrest (Fig. 5⇓A). These results are consistent with the inhibitory effects of SOCS1 on JAK2 (23), and are in agreement with earlier reports on the effect of SOCS1 in IFN-γ-stimulated wild-type fibroblasts (15, 34). Although the parental and vector-transduced SOCS1−/− fibroblasts showed >80% inhibition of their growth in the presence of IFN-γ, SOCS1−/− cells expressing wild-type SOCS1 were not inhibited at all, as a consequence of the total abrogation of IFN-γ-stimulated STAT1 activation in these cells (Fig. 5⇓B). As anticipated, forced expression of SOCS1R105K did not inhibit STAT1 phosphorylation, but surprisingly rendered the SOCS1−/− cells less sensitive to IFN-γ-induced growth arrest (Fig. 5⇓A). These results suggest that in addition to the JAK-STAT pathway, other unknown IFN-γ-stimulated pathway(s) is involved in mediating the growth arrest. Furthermore, SOCS1 blocks the IFN-γ-mediated growth arrest not only by blocking the JAK-STAT pathway, but also by blocking the additional pathway(s). Although the SH2 domain of SOCS1 is required for blocking the JAK-STAT pathway, it does not seem to be necessary for blocking this additional pathway(s). Effect of reconstituted SOCS1 proteins on IFN-γ-induced growth inhibition and STAT1 phosphorylation in SOCS1−/− fibroblasts. A, A total of 1 × 105 SOCS1+/+ cells, SOCS1−/− cells, or SOCS1−/− carrying pMIEV vector, wild-type (WT) SOCS1, SOCS1R105K, or SOCS1ΔCT expression constructs were plated in 12-well dishes in the presence or absence of 500 U/ml of IFN-γ. After 60 h, cells were counted and the results were expressed as percent inhibition. B, A total of 2 × 105 cells of each line were plated in 60-mm dishes and stimulated with 500 U/ml IFN-γ at 80% confluency. After 30 min, the cells were washed and incubated in IFN-γ-free medium. At the indicated time points, the cells were lysed in SDS sample buffer, and equivalent amount of proteins was electrophoresed and probed for phospho-STAT1 and STAT1 levels by Western blotting. Failure of SOCS1−/− fibroblasts to up-regulate MHC class II molecules after IFN-γ stimulation was specific to MHC class II molecules, as the induction of MHC class I molecules by IFN-γ was comparable between wild-type and SOCS1−/− cells (see Fig. 3⇑B). In SOCS1−/− cells, constitutive expression of wild-type SOCS1 completely abolished IFN-γ-stimulated expression of both MHC class I and class II molecules (Fig. 6⇓). This could be attributed to the inhibition of JAK activity and subsequent STAT1 phosphorylation by the constitutively expressed SOCS1 (Fig. 5⇑B), because STAT1 phosphorylation is required for both MHC class II and class I expression. Surprisingly, SOCS1R105K restored MHC class II expression in SOCS1−/− fibroblasts and did not affect MHC class I induction (Fig. 6⇓). 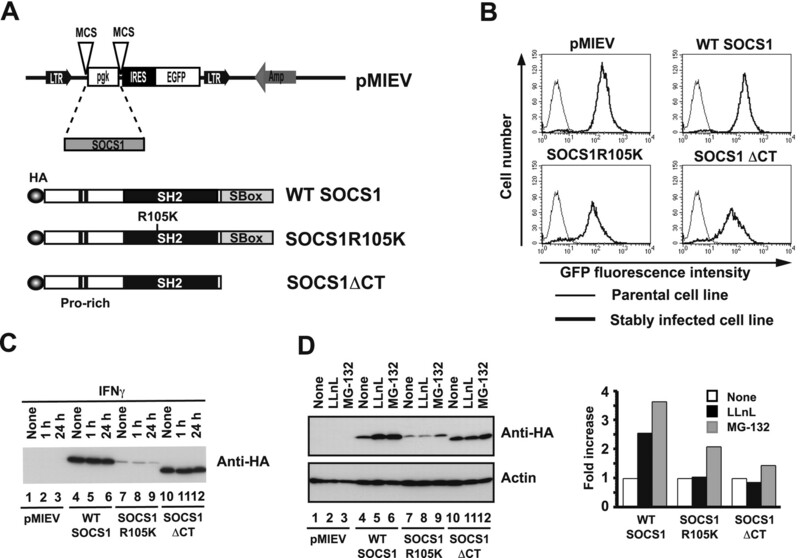 Failure of SOCS1−/− cells to up-regulate MHC class II molecules despite sustained STAT1 activation, and its reversal by SOCS1R105K strongly suggest an essential role for SOCS1 in MHC class II expression that does not require the phosphotyrosine-binding capacity of the SOCS1 SH2 domain. Effect of reconstituted SOCS1 on MHC class II expression in SOCS1−/− fibroblasts. A total of 1 × 105 SOCS1−/− cells or SOCS1−/− cells carrying pMIEV vector, wild-type (WT) SOCS1, SOCS1R105K, or SOCS1ΔCT expression constructs were plated in 12-well dishes in the presence or absence of 500 U/ml IFN-γ. After 60 h, cells were stained for MHC class II and MHC class I expression and analyzed by flow cytometry. Identical results were obtained with an independent SOCS1−/− cell line reconstituted with the SOCS1 constructs (not shown). Up-regulation of MHC class II surface expression by IFN-γ is regulated primarily at the transcriptional level (43) and requires, in addition to STAT1 activation, up-regulation of CIITA and presence of the constitutively expressed USF-1 (41). To understand the defect in SOCS1−/− fibroblasts that underlies the inefficient MHC class II expression, we examined the levels of IFN-γ-induced gene expression by semiquantitative RT-PCR (Fig. 7⇓A). Both I-Aβb and I-Eβb MHC class II genes were induced in SOCS1−/− fibroblasts to levels identical with the wild-type cells. Similarly, induction of CIITA gene was comparable between SOCS1−/− and wild-type fibroblasts. In addition, there was no discernible alteration in the levels of a USF-1 in SOCS1−/− fibroblasts (Fig. 7⇓B). Up-regulation of PA28a, a component of the 19S regulatory subunit of the proteasome, served as a control for IFN-γ activity (Fig. 7⇓B). These results showed that assembly of the multicomponent transcriptional machinery is normal at the MHC class II promoter in SOCS1−/− cells. Constitutive expression of SOCS1 in the SOCS1−/− cells completely blocked the expression of CIITA, with concomitant lack of transcripts for I-Aβb and I-Eβb (Fig. 7⇓A), emphasizing the importance of the JAK-STAT pathway in MHC class II gene induction. In contrast, in SOCS1−/− fibroblasts reconstituted with SOCS1R105K, which permitted MHC class II up-regulation, IFN-γ-induced CIITA, I-Aβb, and I-Eβb expression were not significantly higher than the parental cells (Fig. 7⇓A). These results show that the defect in MHC class II induction in SOCS1−/− cells occurs at the posttranscriptional level. IFN-γ-induced gene expression in SOCS1−/− cells reconstituted with SOCS1 constructs. A, A total of 2 × 105 cells of each line shown in Fig. 6⇑ were plated in 60-mm dishes and stimulated with 500 U/ml of IFN-γ at 80% confluency. After 48 h, RNA was extracted from the cells and cDNA synthesized. Ten-fold serial dilution of cDNA was used to evaluate the expresion of I-Aβb, I-Eβb, I-Aα, CIITA, Ii, and actin using the primer sets given in Materials and Methods. B, Cells stimulated in the same way as in A were lysed in sample buffer and analyzed for the expression of USF-1, PA28α, and actin by Western blot. Cell surface expression of the newly synthesized MHC class II α- and β-chains requires their association with Ii for transport to the cell surface (44). In the absence of Ii, the MHC class II molecules accumulate within the cell (45). Because the expression of Ii is also up-regulated by IFN-γ, we examined the induction of Ii following IFN-γ stimulation. RT-PCR analysis showed that the IFN-γ-stimulated increase in Ii transcript was comparable between SOCS1−/− and SOCS1+/+ cells (Fig. 7⇑A). Surprisingly, IFN-γ-induced Ii up-regulation was not inhibited by constitutively expressed SOCS1, suggesting that the induction of Ii following IFN-γ stimulation occurs independently of the JAK-STAT pathway. To evaluate whether the MHC class II proteins accumulate intracellularly due to a defect in transport to the cell surface, we stained the IFN-γ-stimulated cells for intracellular MHC class II molecules after blocking the surface molecules with unlabeled Ab. Unlabeled blocking Ab completely inhibited surface staining of MHC class II (Fig. 8⇓), whereas a nonspecific Ab of the same isotype did not (see Fig. 3⇑A). Intracellular staining following surface Ag blocking showed intense staining in IFN-γ-stimulated wild-type cells and SOCS1−/− fibroblasts reconstituted with SOCS1R105K mutant, whereas parental SOCS1−/− fibroblasts showed no evidence for intracellular accumulation of MHC class II proteins. These results show that the defective MHC class II expression in SOCS1−/− fibroblasts is not due to a defect in transport to the cell surface. Mechanism underlying the defective MHC class II induction in SOCS1-deficient fibroblasts. A, Intracellular staining of MHC class II in SOCS1−/− fibroblasts. SOCS1−/− cells, SOCS1+/+ cells, or SOCS1−/− fibroblasts reconstituted with SOCS1R105K were stimulated with 500 U/ml IFN-γ for 60 h and stained for MHC class II expression (top panel). Middle panel, Shows the blockade of surface staining after incubation with 100 μg/ml of unlabeled M5 mAb. The blocked cells were incubated with labeled Ab in 0.3% saponin to stain intracellular MHC class II, and analyzed by FACScan (bottom panel). B, A total of 2 × 105 cells of one SOCS1+/+ and two SOCS1−/− fibroblast lines were plated in 60-mm dishes and stimulated with 1000 U/ml of IFN-γ at 80% confluency. After 36 h, the cells were pulsed with [35S]Met and Cys for 60 min and lysed, and MHC class II proteins were immunoprecipitated, as detailed in Materials and Methods. Autoradiograms of the protein bands corresponding to α- and β-chains of I-A and I-E are shown after 7-day exposure. C, Schematic representation of the retroviral constructs pBMN-I-Abα and pBMN-I-Abβ for stable expression of I-Ab α- and β-chains. D, Constitutive expression of I-Abαβ in SOCS1+/+ and SOCS1−/− fibroblasts. Fibroblast lines sequentially transduced with retroviruses (Figure legend continues) encoding I-Ab α- and β-chains were examined for cell surface expression of the MHC molecule by flow cytometry using M5-PE. E, Steady state levels of I-Ab α- and β-chains in stable transgenic lines. Equal numbers of parental and I-Abαβ transgenic SOCS1+/+ and SOCS1−/− fibroblasts were lysed in SDS sample buffer and evaluated for steady state levels of I-Ab α- and β-chains by Western blot for the His tag. Actin served as a protein loading control. F, Increased rate of degradation of I-Ab α- and β-chains in IFN-γ-stimulated SOCS1−/− fibroblasts. A total of 2 × 105 cells of I-Abαβ transgenic SOCS1+/+ and SOCS1−/− fibroblasts were plated in 60-mm dishes, and one set was stimulated with 1000 U/ml of IFN-γ at 80% confluency. After 36 h, both unstimulated and IFN-γ-stimulated cells were treated with 10 μM CHX. The control dish that did not receive CHX was lysed immediately, and others were lysed at indicated time points in SDS lysis buffer. Equivalent amounts of proteins were examined for I-Ab α and β proteins by Western blot with actin as loading control. Right panel, The protein bands corresponding to I-Ab α- and β-chains were quantitated by scanning densitometry, and the amount of I-Ab α and β remaining at different time points after inhibition of protein synthesis was evaluated in comparison with the amount present in CHX-untreated cells. Correction for protein loading was not required because densitometric values corresponding to actin were comparable in all lanes within each set. Our results suggested that the markedly reduced MHC class II up-regulation in IFN-γ-stimulated SOCS1−/− cells might result either from inefficient translation of MHC class II transcripts or from rapid turnover of these proteins in the absence of SOCS1, or both. Metabolic labeling of IFN-γ-treated SOCS1−/− and control fibroblasts showed very small amounts of MHC class II proteins in SOCS1-deficient cells (Fig. 8⇑B), too little to carry out a meaningful pulse-chase analysis for protein stability. To overcome this obstacle, we generated SOCS1−/− and SOCS1+/+ fibroblasts that constitutively expressed both α- and β-chains of I-Ab and transported the I-Abαβ heterodimer to the cell surface (Fig. 8⇑, C and D). The steady state levels of α- and β-chains in SOCS1−/− fibroblasts were slightly lower than in wild-type cells (Fig. 8⇑E). However, examination of protein stability using CHX, a general inhibitor of protein translation, did not reveal any appreciable difference in protein turnover (Fig. 8⇑F, upper panels), indicating that the difference in steady state levels could be due to variability in the copy number of the transgene. Strikingly, following 36-h IFN-γ stimulation, SOCS1−/− fibroblasts showed a faster turnover of both α- and β-chains of I-Ab than wild-type cells (Fig. 8⇑E, bottom and right panels). These results show that MHC class II proteins are less stable in IFN-γ-stimulated SOCS1−/− fibroblasts. SOCS1 interferes with IFN-γ signaling by inhibiting the JAK kinases through the binding of SOCS1 SH2 domain to the activation loop phosphotyrosine residue of the JAKs (23). The C-terminal end of the SOCS1 molecule, the SOCS box, is implicated in targeting the bound Tel-JAK2 to the VHL-Elongin C-Elongin B complex ubiquitin ligase (30, 31, 32). Ensuing ubiquitination targets the bound JAKs to the proteasomal degradation machinery. To determine whether the SH2 domain and the SOCS box should function coordinately to attenuate IFN-γ signaling, we introduced SOCS1 with a truncation deleting the entire SOCS box (SOCS1ΔCT) into SOCS1−/− cells (Fig. 4⇑A). Analysis of IFN-γ responses of the SOCS1−/− fibroblasts reconstituted with SOCS1ΔCT showed that SOCS box-deleted SOCS1 was equally potent in blocking the IFN-γ-mediated growth arrest as the wild-type SOCS1, and efficiently blocked IFN-γ-stimulated STAT1 phosphorylation (Fig. 5⇑). These results showed that the SOCS box is dispensable for suppressing the growth-inhibitory activity of IFN-γ. Moreover, SOCS1ΔCT did not block the up-regulation of CIITA, I-Aβb, and I-Eβb gene expression (Fig. 7⇑A), suggesting that inhibition of IFN-γ signaling by SOCS1ΔCT may not be complete without the SOCS box-mediated capture of activated JAKs and probably other downstream signaling molecules for ubiquitination and proteasomal degradation. SOCS1 is strongly induced in fibroblasts following IFN-γ stimulation (15). Overexpression of SOCS1 inhibits both JAK1 and JAK2, and completely blocks IFN-γ responses (15, 17, 33, 34, 46). Therefore, in the absence of SOCS1, we expected an exacerbation of the IFN-γ responses in SOCS1−/− fibroblasts. Indeed, we observed an increased sensitivity of the SOCS1−/− fibroblasts to IFN-γ-mediated growth arrest (Fig. 1⇑). However, contrary to our expectation, IFN-γ-stimulated MHC class II surface expression was markedly diminished in SOCS1−/− fibroblasts. Both growth inhibition and induction of CIITA transcription factor required for MHC class II expression by IFN-γ require activation of STAT1 (40, 41). The sustained STAT1 phosphorylation in SOCS1−/− fibroblasts correlated well with their increased susceptibility to IFN-γ-induced growth arrest, but not with MHC class II surface expression, indicating that: 1) STAT1 activation alone is not sufficient, and 2) SOCS1 is required for inducible MHC class II surface expression in fibroblasts. Reconstitution of the SOCS1−/− fibroblasts with mutant SOCS1 constructs confirmed these predictions, and revealed that SOCS1 does not require its phosphotyrosine-binding capacity to facilitate inducible MHC class II expression in fibroblasts. MHC class II expression is regulated at multiple levels. Both constitutive and inducible MHC class II expression require the critical transcription factors CIITA, RFX5, and USF-1 for the transcription of MHC class II genes (7). Inherited mutations within these genes are characterized by the lack of MHC class II expression and defective T cell development leading to the Bare lymphocyte syndrome (6). A number of reports have documented other pathological and physiological conditions that result in defective MHC class II gene transcription. Suppression of CIITA expression by human CMV underlies its inhibition of IFN-γ-induced MHC class II expression (47). Chlamydiae interferes with MHC class II expression by targeting USF-1 and RFX5 to proteasomal degradation (48, 49). However, we did not find any change in the induction of CIITA message or in the level of USF-1 protein in SOCS1−/− fibroblasts compared with wild-type cells (Fig. 7⇑). Fibroblasts deficient in retinoblastoma protein pRB show defective I-Aβ gene expression despite normal CIITA induction (50). MHC class II gene expression has been also reported to be actively repressed by PU.1 (51), and by an IFN-γ-induced transcriptional repressor p202 that interacts with pRB (52, 53). Recently, the inducible MHC class II expression in murine macrophages has been shown to be transcriptionally regulated in a cell cycle-dependent manner (54). The fact that SOCS1−/− fibroblasts showed normal induction of I-Aβb and I-Eβb genes indicates that assembly of the complex transcriptional machinery at the promoter region of MHC class II genes is not impaired in SOCS1−/− fibroblasts. Therefore, the decreased surface expression of MHC class II in SOCS1−/− fibroblasts must arise from a posttranscriptional defect. Lack of intracellular accumulation of MHC class II within the SOCS1−/− fibroblasts favors a hypothesis that the defect might arise from alterations in mRNA stability, translation initiation, and progression, or the t1/2 of the protein. Recent studies show that MHC class II protein expression is additionally regulated at the translational level (55, 56). For example, up-regulation of the α- and β-chains of I-A in a B cell line (A20) following IFN-γ stimulation is not accompanied by an increase in mRNA levels or mRNA stability, even though there is a 3-fold increase in surface expression (56). This increase in surface expression is accompanied by a marked increase in the amount of mRNA bound to polyribosomes. Neither the factors nor the mechanism that contribute to more efficient translation of I-Aα and I-Aβ mRNA following IFN-γ stimulation have been defined yet, but these observations clearly indicate that translational regulation is another potential control point in MHC class II expression and SOCS1 may be involved in translational activation or translational derepression. One of the well-defined translational activation pathways involves the phosphatidylinositol-3 kinase (PI3K)-Akt/PKB-mTOR pathway, leading to phosphorylation of 4E-BP and release of eIF-4E to form an active translation initiation complex at the 5′ cap of the mRNA (57). Nguyen et al. (58) have recently shown activation of the PI3K pathway and phosphorylation of Akt in murine fibroblasts following IFN-γ stimulation. We examined whether MHC class II expression was inhibited by Wortmannin added at different time points after IFN-γ stimulation, and we could not find evidence for a role of PI3K-dependent translational activation in MHC class II surface expression (data not shown). We have used constitutively expressed α- and β-chains of I-Ab to address whether MHC class II proteins are degraded in SOCS1−/− fibroblasts. We show that MHC class II proteins are degraded in IFN-γ-stimulated SOCS1−/− fibroblasts with a faster kinetic than in control cells. These results strongly suggest that IFN-γ stimulation not only induces MHC class II expression, but also initiates a protein degradation program. In normal cells, this degradation process appears to be delayed by the concomitantly induced SOCS1, so that the MHC class II proteins could carry out their Ag presentation function for longer duration. IFN-γ induces significant changes to the proteasomal protein degradation machinery to generate immunogenic peptides for MHC class I Ag presentation (59). We are investigating whether MHC class II proteins are degraded by the proteasomal pathway. A recent report showing transcriptional activation of several genes by IFN-γ independently of STAT1 (60) raises the possibility that additional IFN-γ-induced pathways, which are probably regulated by SOCS1, may be involved in the coordinated regulation of MHC class II surface expression. Constitutive expression of wild-type SOCS1 in SOCS1−/− fibroblasts completely blocked IFN-γ-induced growth arrest and MHC class II and class I gene expression by inhibiting the JAKs required for STAT1 phosphorylation. The JAK proteins bound to SOCS1 have been shown to be targeted for ubiquitin-dependent proteasomal degradation, a process that requires an intact SOCS box (30, 31). However, similar to the observations of Kamizono et al. (31), the degradation function of SOCS1 is not essential for blocking IFN-γ responses, as the SOCS1ΔCT was as efficient as the wild-type SOCS1 in inhibiting IFN-γ-mediated growth arrest (Fig. 5⇑A). Our results also suggest that the SOCS box is involved in the regulation of SOCS1 protein levels, because wild-type SOCS1, but not SOCS1ΔCT, was stabilized by proteasomal inhibitors (Fig. 4⇑D). The SH2 domain may also be involved in regulating SOCS1 protein levels, as accumulation of SOCS1R105K in the presence of proteasome inhibitors was not comparable with that of wild-type SOCS1. Because SOCS1 contains only one lysine residue, and a conserved point mutation of this lysine does not alter the t1/2 of SOCS1 (our unpublished results), molecular dissection of the SOCS1 protein is required to understand the mechanisms underlying its rapid turnover. 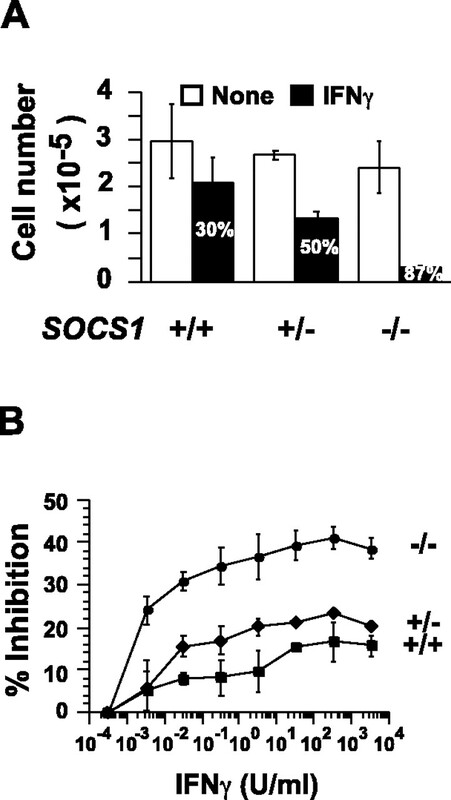 Consistent with earlier reports (23), SOCS1R105K failed to inhibit STAT1 phosphorylation in SOCS1−/− cells. Despite a low level of expression, SOCS1R105K in SOCS1−/− cells has revealed two unexpected roles for SOCS1 in IFN-γ signaling. First, despite its inability to block STAT1 phosphorylation, SOCS1R105K inhibited IFN-γ-induced growth arrest (Fig. 5⇑A), suggesting that SOCS1R105K mediates this effect downstream of STAT1 phosphorylation. Second, SOCS1R105K restored the MHC class II expression in SOCS1−/− fibroblasts, which failed to up-regulate MHC class II despite prolonged STAT1 phosphorylation (Fig. 6⇑), suggesting that a certain critical level of SOCS1 expression is required for MHC class II expression in IFN-γ-stimulated fibroblasts. In both instances, SOCS1 did not require the phosphotyrosine-binding capacity of its SH2 domain to mediate the novel functions. Several SH2 domains have recently been shown to bind to their physiological protein partners in a phosphotyrosine-independent manner (61, 62). In such a scenario, proteins bound to the mutant SH2 domain of SOCS1 may still be targeted for ubiquitination and proteasomal degradation via the E3-ligase substrate adaptor function conferred by the SOCS box. In conclusion, we have observed that IFN-γ-induced growth arrest and MHC class II induction occur through overlapping, but distinct signaling pathways. Although persistent JAK activation and STAT1 phosphorylation in SOCS1-deficient fibroblasts are sufficient to cause growth arrest, they are insufficient to up-regulate MHC class II expression. 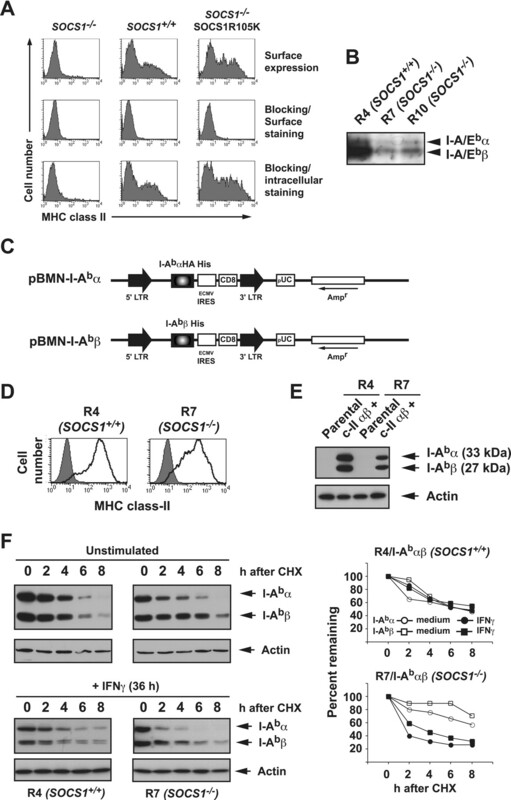 The requirement for SOCS1 for MHC class II expression suggests that SOCS1 functions not only as a negative feedback regulator of the JAK kinases, but also as a positive regulator in some aspects of cytokine signaling. One such positive regulatory function appears to be prolongation of the t1/2 of IFN-γ-induced MHC class II expression. We thank Dr. James Ihle for generously providing the SOCS1−/− mice; Drs. Eleanor Fish, Peter Greer, Linda Penn, and Tania Watts for reagents; Dr. Ronald Germain for valuable advice and reagents; Dr. Philippe Poussier, Dr. Sheela Ramanathan, and members of the Rottapel lab for helpful discussions; and Claude Cantin for cell sorting. ↵1 This work was supported by the Terry Fox Group Grant of the National Cancer Institute of Canada. R.R. is a Canadian Institutes for Health Research scientist. S.I. is a recipient of the Canadian Institutes for Health Research postdoctoral fellowship. ↵2 Current address: Institut National de la Santé de la Recherche Médicale Unité 19, 13009 Marseille, France. ↵4 Abbreviations used in this paper: SOCS1, suppressor of cytokine signaling 1; CHX, cycloheximide; CIITA, class II transactivator; GFP, green fluorescent protein; HA, hemagglutinin; Ii, invariant chain; IRES, internal ribosomal entry site; IRF, IFN response factor; JAK, Janus kinase; MEF, mouse embryonic fibroblast; PI3K, phosphatidylinositol-3 kinase; SH2, Src homology 2; USF, upstream stimulatory factor.